Ezralow Dance Company will bring its unique mix of contemporary dance and striking visuals to Pepperdine University’s Smothers Theatre in Malibu on Wednesday, January 10, at 8 PM. Ezralow Dance is a movement-based ensemble known internationally for its fluid physicality, thoughtful humor, and creative blend of vivid fantasy and dramatic emotion. It is comprised of performers, visual artists, composers, filmmakers, writers, technicians, and designers, with a diversity of creative work that includes the development and touring of signature works; a catalogue of international commissions spanning and mingling the disciplines of dance, theatre, film, visual arts, opera, and performance; mentoring and internship programs; and explorative research projects combining storytelling, technology, and the arts, probing the questions of dancing and humanity. 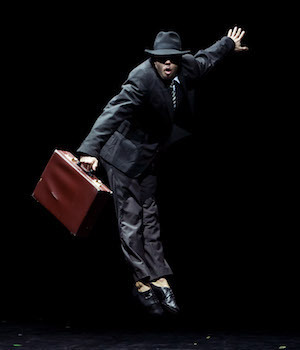 The company's founding artistic director and choreographer, Daniel Ezralow, began his professional career as a dancer with the dance companies 5X2 Plus, Paul Taylor, Lar Lubovitch, and Pilobolus. His professional life has since grown to include work as a director and choreographer in a variety of platforms. He has created live and filmed events at the Louvre Museum and the Pompidou Centre (Paris), Yankee Stadium and the Guggenheim Museum (New York City), the Getty Museum and the Ford Theaters (Los Angeles) and the opening ceremonies of the 2014 Winter Olympics in Sochi, Russia. As a choreographer, Ezralow has commissioned original works for Paris Opera Ballet, Batsheva Dance Company, Hubbard Street Dance Chicago, and Philadanco, amongst others. His choreography and aerial creations are in The Beatles LOVE by Cirque du Soleil, Broadway’s Spider-Man: Turn off the Dark, and the seminal musical film Across the Universe. In television, Ezralow conceived and created the About the Artists award-winning dance specials Windows (Bravo), Episodes (PBS), and Josh Groban in Concert (PBS), and has choreographed music videos and staged shows for musicians including Josh Groban, Andrea Bocelli, Sara Bareilles, Sting, David Bowie, and U2. Ezralow’s work has earned him two American Choreography Awards for innovative and outstanding choreography, a Choreographic Media Honors Award, an Emmy Award, Emmy nomination, the Premio Positano (Italy), a Nijinsky Award, an Ischia Award, and an NEA Choreographic Fellowship. Ticket prices range between $10 and $45, and are required for attendance. For additional information about the performance, and to purchase tickets, visit the Center for the Arts website.